A visit to Taiwan can be demoralizing for a struggling student of Chinese such as myself. For one thing, traditional characters are used instead of the simplified system, so that my hard-won learning of basic hanzi was useless to me. Secondly, place names are generally romanized in Wade-Giles rather than Pinyin. This nearly resulted in us buying tickets to Taichung, when we wanted to go to Taitung. Because Taitung is actually pronounced Taidong, and Taichung is Taizhong. Worse, the local train was packed, and without reservations, we were chased from seat to seat, at times standing forlornly in the corridor. 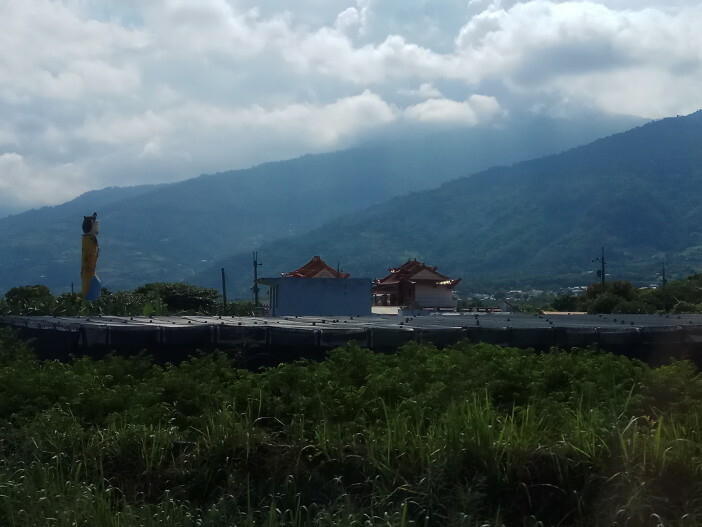 So although it was a picturesque journey through beautiful scenery, we were tired by the time we reached Taitung. Fortunately, Taitung is a sleepy town. We were drawn there, as are many others, as a step to our ultimate destination of Orchid Island (Lanyu), and decided to spend a couple of days there to rest and break the journey, rather than because it’s a must-see location. Its main attraction, the museum of Taiwanese aboriginal culture, was closed on our only full day there. However aboriginal influence is everywhere in Taitung. 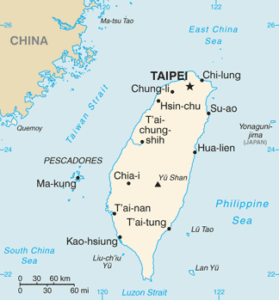 The earliest inhabitants of Taiwan were not Chinese, but ethnically and linguistically related to the Austronesian people found throughout the Pacific, from Malaysia to Hawaii. They’re now a minority, their languages sadly endangered, but in remoter corners like Taitung, they are still a significant presence. And as we discovered from a curious mural on the side of a house, new traditions are still developing alongside the old ones. 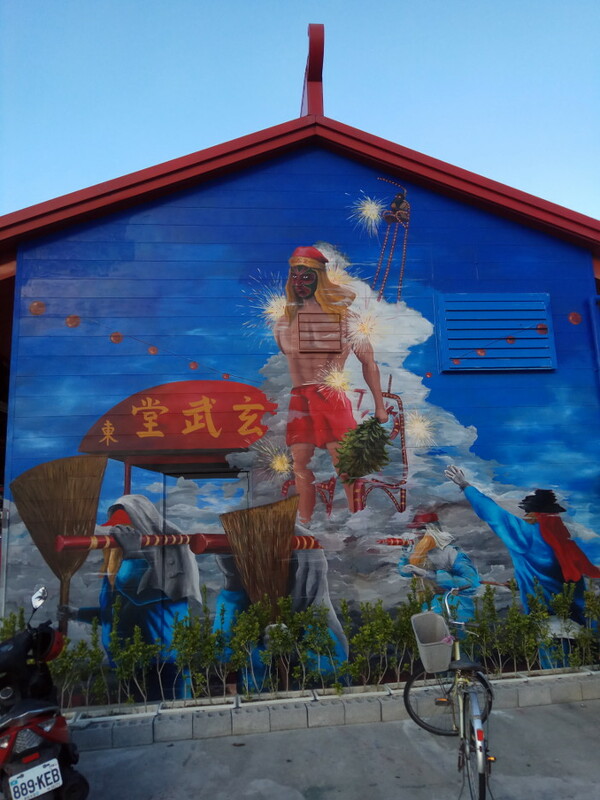 A sign near the mural told us it depicted “Bombing Lord Handan”, but nothing more than that. Wikipedia was no help, but further research revealed this is a ritual dating back only to the 1950s, in which an effigy is carried through the streets, while people throw firecrackers at it. The ritual is apparently connected to gang culture, with gang members able to expiate their sins through the scapegoat figure of “Lord Handan”. Aboriginal culture was also prominent in the Railway Art District. The new railway station is a few miles outside the city itself, and where the old line cut into town has now been converted into a bohemian district of cafes and fashion boutiques. When we visited a small music festival was taking place, with stalls selling the works of Taitung’s artists and craftspeople. 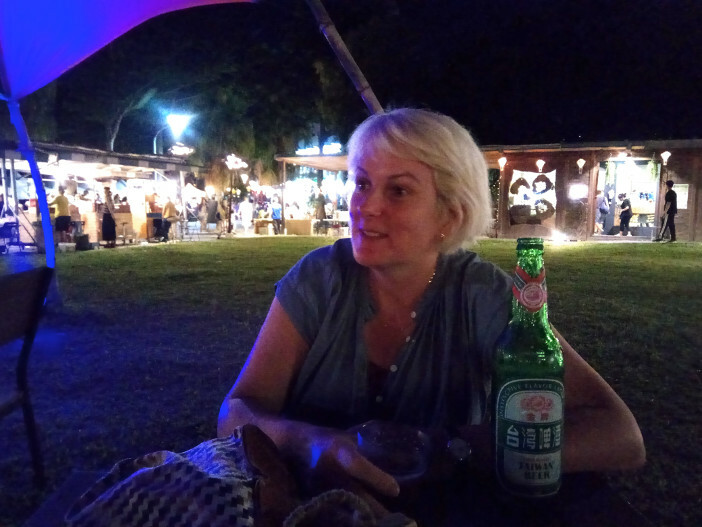 Schoolchildren had decorated balloon lanterns, and we sat under the strings of colored lights, enjoying a Taiwan beer while a local singer performed in what I can only guess to be one of the endangered aboriginal languages. It felt like a more authentic way to appreciate the culture than visiting a museum, and certainly a more laidback one. Taitung’s other tourist draw, its beach, was clean, and mostly empty. 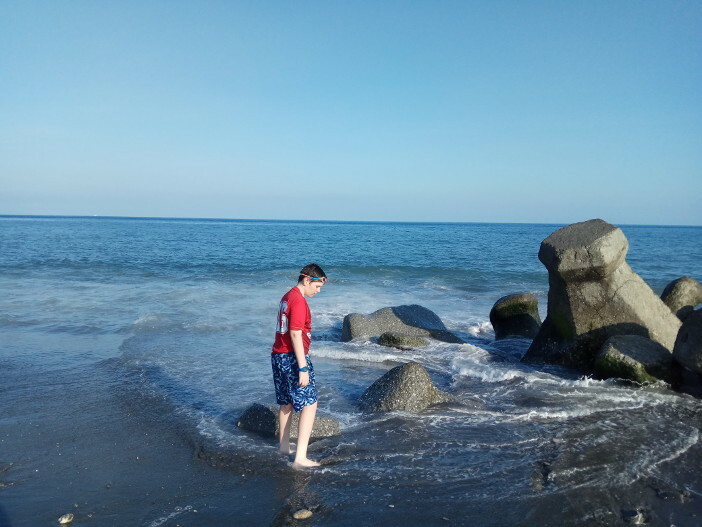 The black sand may not be everyone’s ideal but it was soft enough, though there were bands of stones which made walking into the sea uncomfortable. Strong currents and steep underwater drops mean it’s only suitable for confident swimmers, but lots of fun if treated with respect. Looking out onto the empty horizon, Taitung felt like the edge of the world. However, we planned to go over the edge. Much of our time there was spent trying to arrange our transport to Lanyu. There are six flights daily, but no way of booking online. The plane is a small single-engine turboprop with only twenty seats, some of which are reserved for locals, and flights are frequently canceled due to high winds. So we abandoned our hopes of that particular adventure and went to the port to find out about ferries. Here, we learned that tickets only go on sale one hour before the ship sails. The idea of turning up with all our suitcases, not knowing whether we could actually travel, was a little unnerving. Fortunately, we found a local agent who spoke some English. He was very keen to sell us a package deal including scooter hire, barbecues, and other backpackers’ delights not wholly suitable to a family, but we persuaded him just to arrange our ferry tickets and accommodation on the island. And so we were ready for the final stage of our adventure.